r a m y h a n n a . c o m: DMC glossy samples everywhere! There's alot of talk about what are the best sampling settings in v-ray, but without the results to look at. So I sat out to put together a chart to help me and others understand how to get the most out of the Adaptive DMC sampler in v-ray. This chart takes the same 3D model with baked light calculations (irr. map and light cache), to keep the render times just for sampling. I compared the combination of the DMC min, max values with the materials reflection glossiness samples to see what would give optimum results. I also went a step further and compared these settings while tweaking the global DMC Sampler adaptive amount with the noise threshold to get some interesting results. Check out the pdf, and decide for yourself what are the best settings. 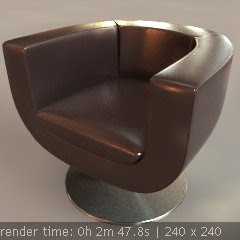 Here's the max file (max 2008, vray 1.5 sp1) if you're interested in the rest of the settings. I was using an hdr map, so you will notice a broken link to that map.